US-backed militia claims to have captured 'caliphate' home base. Reuters quoted a witness who reported that US-backed militias have raised a flag inside Raqqa stadium today (Tuesday), concluding a four-month battle to take ISIS’ Syrian capital. 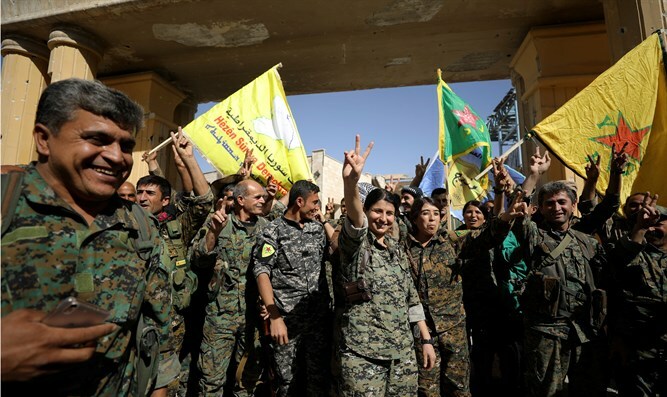 The Financial Times quoted Rojda Felat, commander of the Raqqa campaign for the Syrian Democratic Forces (SDF) saying that the fighting was over but the alliance of Kurdish and Arab militias was clearing the stadium of mines and any remaining ISIS operatives in hiding. The paper said that the Syrian Observatory for Human Rights, a war monitor, confirms that the city is now completely cleared of ISIS forces. Raqqa is the city where ISIS staged flamboyant parades marking its spate of easy victories in 2014, and from that city they planned international attacks. The SDF, backed by a US-led international coalition, has fought ISIS in Raqqa since June. Another Reuters witness was quoted by FT saying militia fighters celebrated in the streets, shouting slogans from their vehicles. The flag raised in the stadium and in city streets bore the emblem of the Kurdish YPG, the strongest militia in the SDF. “We do still know there are still IEDs and booby traps in and among the areas that ISIS once held, so the SDF will continue to clear deliberately through areas,” said Colonel Ryan Dillon, a spokesman for the coalition. ISIS lost vast expanses of territory in Syria and Iraq this year, including its most prized asset, Mosul. In Syria, ISIS has been forced back to a part of the Euphrates valley and surrounding desert area. Raqqa marked the first big city captured by ISIS in early 2014, before its rapid series of victories in Iraq and Syria brought millions of people under the self-declared caliphate's rule, which decreed laws and issued passports and currency. ISIS used the city as a command and control center for its Middle East wars and its overseas attacks, and at one point imprisoned western hostages there before murdering them in propaganda films distributed over the Internet.